It’s a message board where people can share business ideas and trends in real time. A platform where different currencies can be traded for your needs. A periodic newsletter with industry trends, updates and new products. A “product of the month” feature every month with the hottest products on barter. Reach thousands of barter members by posting unlimited ads in the barter classifieds for FREE. An incredible 3,500 acre 5-star winery/resort (The Chateau Elan) was the venue for the 21st convention of NATE. Located about an hour’s drive north of Atlanta, it was the most spectacular setting ever for NATE’s annual effort. Ric and Andrea Zampatti and the service-oriented staff from The Barter Company were responsible for lining-up the impressive resort where everything—room, food & beverages, along with upscale spa services, were all 100% trade. The May 5-7 event in Georgia saw Deborah Lombardi taking over as president from Victor Castano, thus becoming the first woman president of NATE. Broker of the Year Award to Donna Burlingham of Eagle Barter Exchange. President’s Award to Johnny Eagle of Eagle Barter Exchange. The Monkman/Crumpton Award (NATE’s most prestigious award) to Fran Crumpton of Gulf Coast Trade Exchange. Aside from the many activities of the convention, the resort provided an equally impressive experience. The very warm and genuine services of the Chateau’s entire staff, beginning with its hands-on president and CEO Henk Evers, was a pleasure. The Southern California office of International Monetary Systems and parent to Continental Trade Exchange (OTCBB:INLM) has moved, with the intention of expanding its marketing into key areas of greater Los Angeles. 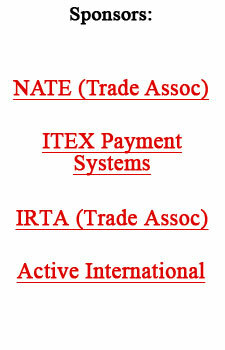 IMS was the sponsor of the recent National Association of Trade Exchanges annual convention in Atlanta, Georgia. And within the last 30 days the company has acquired a trade exchange in both Tennessee and Nevada. For more info go to: www.internationalmonetary.com. A new survey by Deloitte Consulting has found that outsourcing experiences have not measured up to expectations. About one-third of companies that tried outsourcing say they ran into hidden costs, and that vendors have become complacent once contracts were in place. The study also warns companies that they could lose their edge if they turn to contractors to perform core elements of their business. In our April 12 edition we noted the opinion of Warren Buffett, the world’s second richest man, regarding investments (or lack thereof ) in real estate. On May 10 in The Orange County Register a major story appeared in which the “value” investor discussed his position on the nation’s overheated real-estate markets. Every barter company in the world is listed on our web site, click through to our Global List of Barter Companie. The Leading Hotels of the World Ltd. is starting a loyalty program next month. At the same time Relais & Chateaux, a collection of high-end properties mostly outside the U.S., is expanding its loyalty program. While these new programs stress exclusivity and personalized treatment, one thing is clear...to compete today something beyond superb accommodations is needed to entice the high-end clientele. If you’re a frequent airport parker with Park ‘N Fly’s program you soon will be able not only to redeem your parking points for more parking, but to use them to buy merchandise or transfer them with other loyalty programs. PRG Parking Management of Chicago, with lots in seven cities, participates in a loyalty program that gives Spot Club members five points for every dollar spent on parking. Thus, about seven days of paid parking will equal a free day. Customers can manage point totals and redeem parking awards online. Having problems with a contractor on your home renovations and repairs? Homeowners are typically advised to hire licensed contractors, check references, and get a contract. But that still may not be enough. Another source of valuable information is to call the county courthouse for a further check. Information on lawsuits filed against a contractor for job lack of completion and other disputes can be obtained. Home improvement is growing in importance because housing is aging—the average abode is 33, older than at any previous time in U.S. history. This is evidenced by the spending on home improvements over the last four quarters which totals $126 billion, up 15% from 2001 according to Harvard University’s Joint Center for Housing studies. More barter inventory ahead as cruise industry expands, with a torrent of giant new ships to be delivered in 2006. Scheduled to hit the market is a total of 17,000 new berths, requiring about 900,000 new passengers a year. Hedge funds, the large private investment pools that have exploded in popularity this decade, have hit their most challenging performance stretch, with average investment returns dropping about 1.8% in April. (Down 1.6% for the first four months of 2005.) The competition and growth has become very crowded with an estimated 8,000 hedge funds now in operation, up from 4,800 four years ago. Research analyst Gary Vassalotti of Investrend Research has rated barter company International Monetary Systems (OTCBB:INLM) a “Buy/4” with a $0.60 target. In 1989 China had lots of bicycles but only 168 miles of expressways. By the end of 2004—a year during which China spent $42 billion building roads—it had 18,500 miles of highways. And their plan is to reach 51,000 by 2008 (passing America’s 46,500 miles of interstates), according to the Ministry of Communications. Roads are being laid so quickly that China used 40% of the world’s cement (part of the mix) last year.